Whenever I make a Paneer (Cottage Cheese) dish here, I go down the memory lane to Mumbai as we used to get the best paneer out there, trust me, the best paneer I’ve had till now. Punjab Sind was the dairy and we used to get the freshest paneer there, which was so soft and flavourful that we could have it just as is. Marinated Paneer (Cottage Cheese) Cubes deep-fried and cooked with Onions, Capsicums/Bell Peppers and Sauces. It can be had as a delicious starter or main-course dish. In a bowl, mix cornflour and water with a pinch of salt and pepper powder. Stir well. See the consistency. It should not be too thick or too thin (Add more or less water basis that). Dip paneer cubes in the batter and mix well. 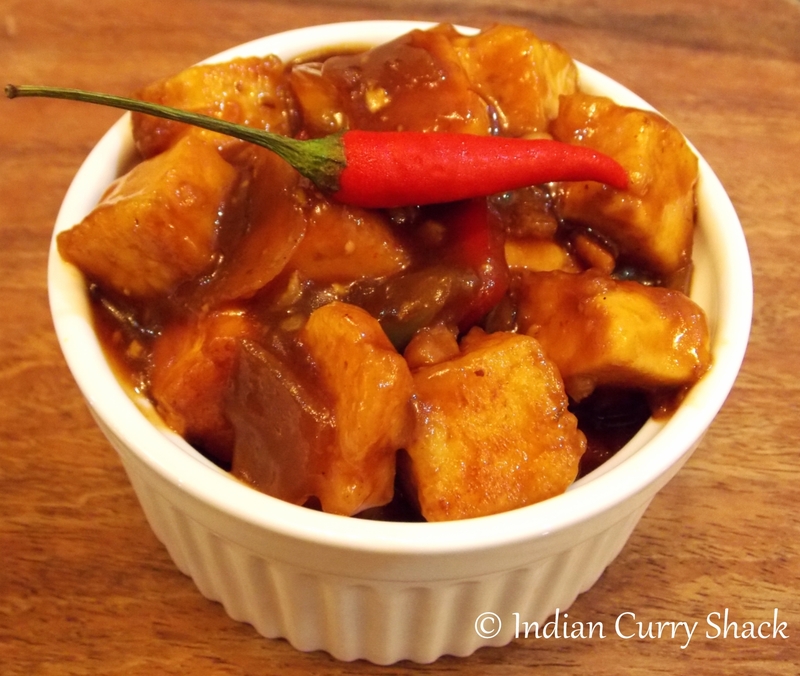 Heat sufficient oil in a kadhai (pan) and deep-fry the paneer cubes on medium heat, till crisp and golden brown. Take the paneer cubes out on a tissue paper so that the excess oil is drained. Heat 2 tbsps of cooking oil in a pan. Add ginger, garlic and saute for a minute. Now add quartered onions and saute till translucent (2-3 minutes). Add salt and pepper and stir. Add capsicums and cook till half cooked. Now add all the sauces (tomato, chilli and soy) and vinegar and give a nice stir. Optionally add 1/4 cup of water if you like more saucy or with gravy. Cook for 2 minutes. Now add all the chopped chillies and paneer cubes and mix well. Cover and cook for 3-4 minutes. Serve hot as a starter or as a main-course with Steamed Rice or Fried Rice. It tastes amazing with Chapati (Indian Bread) too.